Sossusvlei is a salt and clay pan surrounded by high red dunes, located in the southern part of the Namib Desert, in the Namib-Naukluft National Park in Namibia. Sossusvlei is one of the highest sand dunes in the world rising as high as 570m above sea level and stretches to a great expanse of the mighty Namib Desert to almost 500sq km. Sossusvlei literally interprets ‘a gathering place of water’, and actually it’s a clay pan which holds rainwater to form a lake. This pan retains water for a long time due to the high clay content which makes it a rare tourist sight. What makes the area even more extraordinary are the color compositions and enormous dunes. The presence of iron oxides in the sand coupled with innumerable particles of garnet gives the dune its brilliant hue. The shades vary according to the age of the dunes, and the older the dune the brighter the sand’s color. The dunes are often referred to as star dunes because of their crescent shape. Best seen from the air, Sossusvlei offers one of Namibia’s top tourist destinations. The multiple merging crests meet at the highest point resultant of multi-directional winds that blow the sand back and forth. The monumental red sand and the glorious display of diverse shades, colors, and depressions create a spectacular sight for photographers. The dunes display vibrant colors of orange, maroon, and pink, and the Tsaris Mountains show blue and deep purples. The dunes surrounding the vlei are some 350m high when measuring from the base up; having a reputation as some of the highest in the world. This circular-shaped depression filled with water in the heart of the Namib Desert has an exciting history of formation. It has been said that the residue or sand from the Orange River was drifted towards Africa’s western coast and deposited into the mighty Atlantic Ocean. The powerful ocean currents pushed the material towards the north and deposited them back on to the land. By this constant re-deposition, dunes began forming on the coast and the interplay of the coast winds shifted them further inland. The sand deposited on the windward side makes the dune flat, while the leeward side is considerably steeper. However, the patterns on the dune vary according to the direction and speed of the wind and these dunes have taken a million years to be developed. The Sossusvlei today is ever changing and evolving. Game Viewing – Sossusvlei is home to ostrich, springbok, and Oryx which roam the area. Self-Drive Excursions – Sossusvlei is one spectacular place for self-drive excursion tours with 4WD vehicles in Namibia. 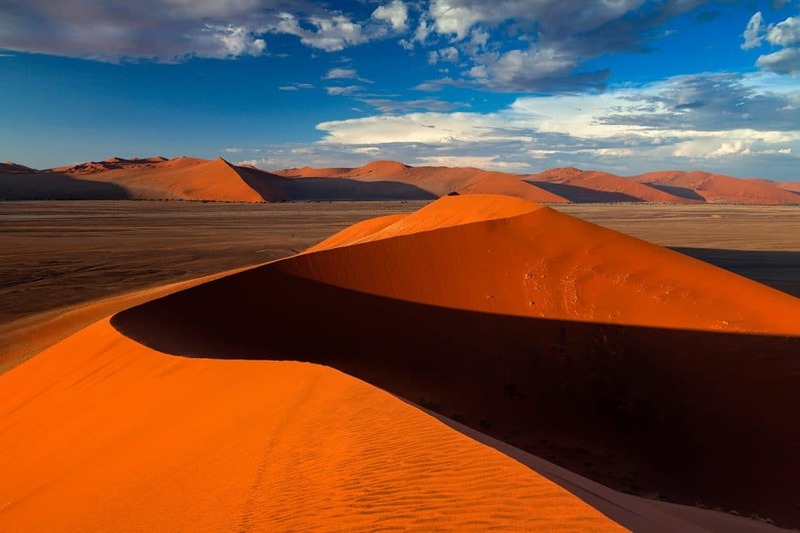 Photographic Safaris – Sossusvlei is lined by exotic, brightly colored dunes. The monumental red sand and the magnificent display of several shades, depressions, and colors, fading, and Deeping, throughout the day create amazing patterns for photographers.